It is an exciting time for fairness and equality. Across the nation, changes in the law have advanced protections for transgender people. Increasing numbers of federal authorities recognize transgender discrimination as illegal. Workplaces, schools, and healthcare and housing programs are more inclusive, gender-congruent identity documents are more accessible, and corrections facilities are more accountable for violence against transgender people behind bars. and treatment in prisons and jails. There is still a lot of work to do. Most states don’t have legal protections for transgender people. Even in states that do, antidiscrimination laws are often not honored or enforced. As an advocate at the ACLU of Washington, I’ve seen schools deny transgender youth the ability to dress, play sports, and access bathrooms in accordance with their gender identity. I’ve seen companies prevent employees and their family members from accessing medically necessary, gender-confirming health care. These are only a few examples – throughout Washington, the reality is that many people struggle to enforce their gender identity and expression rights. This updated guide aims to empower people to protect their civil rights and to be a valuable educational resource for everyone – family members, friends, allies, educators, and service providers who want to learn more about legal protections for transgender people within their communities. Despite advancements in the law, Washington is far from fully realizing transgender equality. 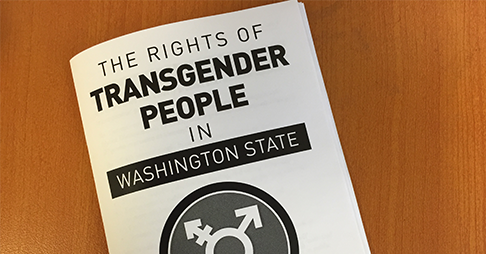 I hope this guide lends support to new and ongoing efforts to defend transgender rights in our state.